Fast Fashion Moving at Lightning Speed - Planet Aid, Inc. Retailers have really been struggling lately. Even in the midst of a steadily rising economy, it seems that every day another major company has declared bankruptcy. The fashion industry is especially vulnerable; just last week, Forbes reported that Wet Seal, a company that had much previous success catering to the teen market, is closing its doors. This news comes in the same month that two other stores declared bankruptcy: DEB Shops, and Delia’s. Other stores like Aeropostale, the Gap, and Urban Outfitters have been struggling financially, proving that the world of fashion retail is more cutthroat than ever. The steep competition stems from our society’s shift into the fast fashion mindset. “Fast fashion” refers to clothing designs that move quickly from the catwalk to store shelves. In the past, new styles were debuted twice a year, and it took retailers months to get these styles from factories and into their stores. Fashion retailers have shortened the turnaround into just a few weeks, creating an ever-increasing demand for more clothes and new styles. They make this possible by using cheap (usually overseas, often exploited) labor and low-quality materials. The garments are quick to manufacture and designed to be disposable. Buyers wear the garments a few times (if that), and then return to the stores for the latest styles. Now, fast fashion retailers are all fighting to be the fastest and cheapest, and many stores are struggling to keep up with some of the giants of the business. Stores like H&M, Zara, and Forever 21 are filled to the brim with $4 shirts and $8 pants that tempt buyers to max out their closet space. For these stores, business is booming and, according to a 2014 study, sales are expected to continue increasing at the stunning rate of 11% yearly over the next 5 years. Today, clothing consumers expect new styles every week and, while that is bad news for the fashion industry in general, its especially bad news for the environment. 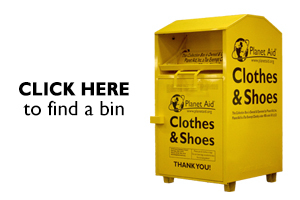 On average, Americans throw away 68 pounds of clothing per year, each. Not only are valuable resources being used to make all that clothing that we are so quickly growing tired of, but most of those clothes go straight to a landfill. It is estimated that only about 15% of textiles are recycled- that’s a lot of waste! First, you can make an effort to be more discerning as a consumer. Try not to buy as much clothing: Do you really need a 10th pair of jeans? Is it absolutely essential to have another pair of black flats? year later, its definitely saving you money over an $8 pair that you need to replace after every wash.
Second, no matter where you buy your clothes or how many you have, you can make sure to always recycle them when they are no longer needed.